Wondering how to write a professional email? Understanding what goes into the perfect email could be the key to effective communication – an invaluable trait for any aspiring leader. According to a report by technology market research firm, The Radicati Group, over a third of the world’s population will be using email by the end of 2019. With so many people using email, especially for business communication, ensuring you’re writing professional emails not only makes for more effective communication, but is an important addition to your leadership skill set. Emails have the ability to do anything from creating a strong (or weak) first impression, to acting as a tool for efficient (or annoying) internal communication in the workplace. Enhance your communication skills by learning how to use a professional email format and write a professional email. Read on to discover how to craft powerful and polished emails. Don’t use a personal account for a business email. Show people that you’re serious about your business by using a company address. Example: Jane Smith has a catering company called Catered Cuisine. Instead of using jane.smith@gmail.com in her email signature, and accompanying it with a picture of her, it would be better to use jane@cateredcuisine.com, accompanied by her company logo. Instead of starting with addresses in the To: line, write your email first and only enter recipients at the end. You’ll avoid the mistaken send. 2) Would you open that email? If the subject line doesn’t give people a reason to open your mail, it may never get read – and that doesn’t lead to effective communication. To ensure you remember to reply to the various forms of communication, give yourself time limits: 2 seconds to answer a phone call, 2 minutes to answer a text, and two hours to respond to an email. 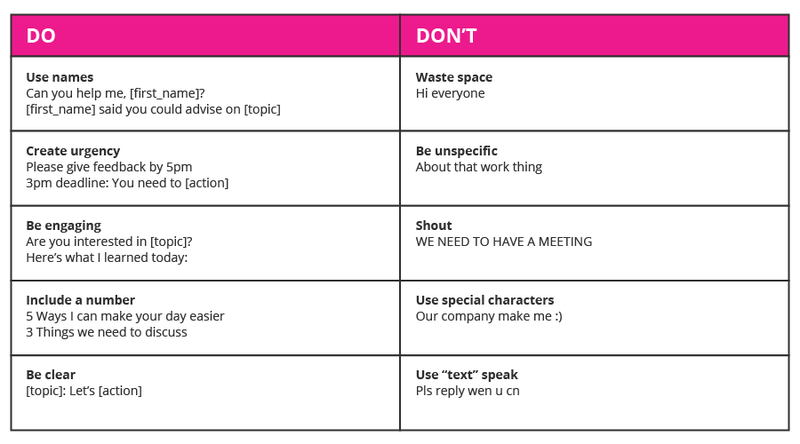 3) Is your email writing costing you clear communication? Nobody wants to search through a lengthy mail to find what’s relevant to them. If you can’t keep it short, make it scannable. For extra points, upskill yourself in business writing. Every email you send is just one of many that your colleagues or other professional connections will receive in a day. In fact, every person receives around 121 business emails per day, and this number is set to rise to 140 in 2018. 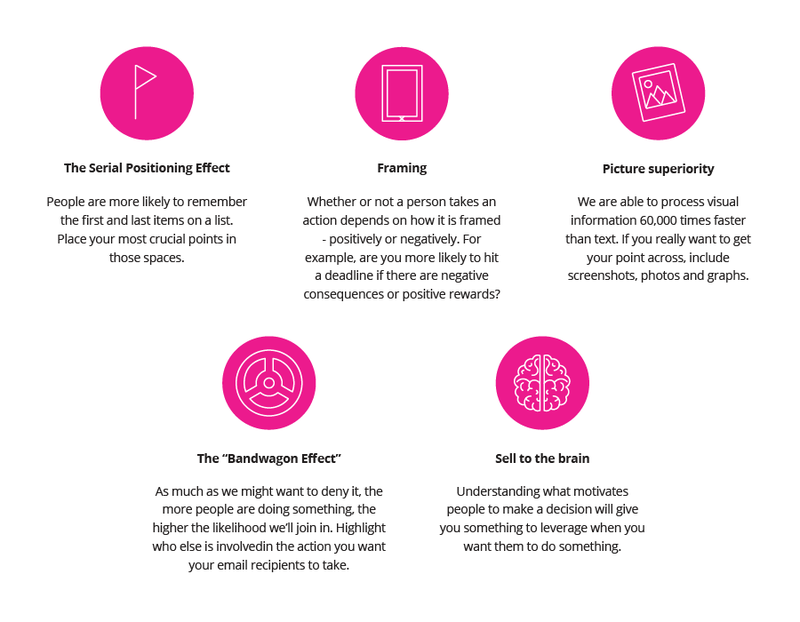 To make yours stand out, follow some simple guidelines and exploit cognitive biases. Most email platforms have a “recall” or”undo” function that offers you the option to cancel an email within a limited timeframe of sending it. Enable it in your settings. Including a memorable email signature is a great way to build your brand, as well as an opportunity to provide essential info. Use your company logo, contact details and links to social profiles. You don’t have to hire a graphic designer to create your logo or signature. Use a drag-and-drop graphic design tool like Canva to do it yourself. If you’re emailing people who don’t know each other, use the BCC: line – no one will be able to reply or see anyone else’s address. If you’re looking to communicate with impact, it’s essential to triple-check for mistakes so that you don’t come across as unprofessional. A strong impression is not made with spelling and grammar mistakes. Use spell-check before sending, and get someone else to give it a quick once-over. Are there jokes or sarcasm that might be misinterpreted? Read your email from the perspective of recipients, or ask someone to sense-check it for you. In the body of your email, did you say you would attach a document? Some email platforms (Gmail) give you an automatic reminder before you send, while others (Outlook) give you the option to turn it on in your settings. Note: You still need to include words like “attach, attachment, I have included, attached” for your email platform to send you the reminder. There are various types of multimedia too large to include as an attachment in an email. The answer? File sharing. Upload your files to the cloud (e.g. Google Drive or Dropbox) and share them with a link. Whether you’re looking to make a change in your career or aiming to have more impact in your current role, a professional approach to email will make you more marketable— through the practice of effective communication and the establishment of a powerful presence—and act as proof that you are what you say you are: a successful professional. Want more insights on career strategy? Have a look through this collection on how to navigate career growth in an organisation.